The Brent index traded again above 50 $/b in various occasions throughout the week. However, the benchmark would close Friday pretty much were it started on Monday, perhaps showing that this fourth leg of the 2016 rally is running out of steam. Corporate news dominated the press pages, with another failed OPEC meeting largely relegated to the background. There is now a good deal of discussion going around a coming petroleum price spike. The unfolding decline in world extraction is becoming pretty obvious with some analysts and pundits even risking to put dates on a return to high prices. While it is true that Brent has rallied for five consecutive months, there are still the above ground stocks to go through. Prior to this hypothetical spike another important event must take place: a shift of the futures curve into backwardation. That will be the first sign of a tightening market, flagging the need for stocks outflows. In Grantham's most recent quarterly report to investors he had the following to say about oil and why he believes it is headed higher. U.S. fracking oil is a small resource, under one and one-half years of global consumption. It will soon run off and show the underlying implacable rising costs of finding ever-diminishing pools of new oil. Existing oil wells deplete faster than they used to because enhanced technologies squeeze more into the early years. Over 5 million barrels a day out of a global total of 95 a year now needs to be replaced every year. Half a new Saudi Arabia! Today's draconian cutbacks in exploration almost guarantee another sharp price spike in the next two to four years. Another OPEC meeting took place this week, again without any concrete outcomes. This time the press did not make much fuss about it, largely anticipating the status quo. OPEC's weakest members are thus left to burn. Many have been those claiming the death of the cartel; the chain of events so far is proving them right. Gulf Opec countries are hailing the return of $50 oil, but for their more economically fragile peers the current price is almost unbearable. Venezuela’s acute fiscal crisis has led to power cuts, shortages and the imposition of a state of emergency, while Nigeria’s oil production has nearly halved due to resurgent militant attacks. Political and security challenges are raging across Iraq. “Venezuela will not default but all the countries are finding financing more difficult and have to find ways in a very difficult market,” says Eulogio Antonio Del Pino, Venezuela’s oil minister, on his arrival in Vienna ahead of Thursday’s meeting of Opec ministers. For the weakest members that also includes strife-ridden Libya and economically weak Algeria, called the “Fragile Five” by some analysts, the current price is worst of all. It is neither high enough to save their faltering economies nor low enough to instigate any collaborative action among the world’s biggest oil producers. The following article brings together a number of loose data points that paint a not so bright future for offshore petroleum extraction. Things are likely to develop a little slower than portrayed here, but nevertheless, the path downwards is pretty clear. Conoco Phillips said last year that it was done with deepwater exploration forever. Marathon Oil announced that all of its budget in 2016 will be directed to its onshore resource plays with only $30 million that was previously committed to going to offshore work. Chevron is pivoting in a major way away from big ticket offshore projects and is hoping to ramp shale output up to 25 percent of the company’s production by the middle of the next decade. [...] It is hard to pinpoint these decline rates exactly since each field is unique. What the industry generally believes is that offshore production declines at twice the rate of conventional onshore. News of attacks by Nigerian rebels on petroleum infrastructure multiply. The country is now extracting little over 1 Mb/d thus facing a serious threat to its budget. A large scale military offensive by the government against the Niger Delta rebels looks increasingly likely. A militant group calling itself the Niger Delta Avengers issued a warning to oil companies working in the region that its campaign is about to get bloody. The Niger Delta Avengers have launched a steady string of attacks on energy infrastructure in the region, issuing a manifesto earlier this month that warned oil companies the attacks marked only a beginning. The group said it was frustrated by what it saw as a lack of attention to the region paid by Nigerian President Muhammadu Buhari. The military said it led a successful campaign against the group during the weekend. In response, the group said it was not engaged in combat with the Nigerian army and no arrests were made. "The Nigerian military cannot intimidate us by harassing innocent Niger Deltans," spokesman Mudoch Agbinibo said in a statement. Even in countries where the socio-economic situation is stable petroleum extraction is declining. China is a very mature region and largely reliant on the Daqing petroleum field that has recently entered terminal decline. China, the world's fourth-largest oil producer, pumped 5.6 percent less crude year-on-year in April, official data showed, as oil firms struggled with cost pressures with crude prices hovering around $40 a barrel. Data from the National Bureau of Statistics released on Saturday showed China produced 16.59 million tonnes of crude oil last month, or about 4.04 million barrels per day (bpd), the lowest rate since July 2013 on a daily basis. [...] Production in the first four months was down 2.7 percent over the same year-ago period to 68.14 million tonnes, or about 4.11 million bpd. Daesh has been loosing ground in Iraq, but on the Syrian front it has regained the initiative and achieved important conquests. Unsurprisingly, Daesh is particular effective along the border with Turkey, that seems to be still its rearguard. Thousands of civilians fled an Isil offensive on Sunday as the terrorist movement achieved its most significant advance along the Turkish border for two years. The three-pronged attack threatened to overrun the last swathe of territory in eastern Aleppo province held by non-jihadist rebels. The Syrian Observatory for Human Rights, a monitoring group, said at least 6,000 people had sought safety in Kurdish-controlled territory to the west. Others joined the burgeoning number of civilians camped along the Syrian side of Turkey’s now closed border. As many as 165,000 displaced people may now be scattered in fields and informal settlements along the frontier, as well as in the nearby town of Azaz. Perhaps it is just a coincidence, but as Daesh progressed along the Turkish border, news re-emerged of Turkey's direct involvement in this war, bombing Kurdish positions and entering (or maintaining?) troops on Iraqi soil. Russia demands that Turkey withdraw its troops from Iraq, the RIA news agency quoted Russian Foreign Minister Sergei Lavrov as saying on Tuesday. A source from the Turkish military said on Tuesday that warplanes recently targeted a camp for Kurdistan Workers Party (PKK) rebels in northern Iraq, killing 14 of them. The promise of abundant "shale gas" in Poland was the greatest energy hoax played in Europe this decade. Every time the press revisits this subject the picture is a bit glimmer. Luckily this hype was never large enough to draw the level of investment that could eventually hurt the general public. Poland is estimated to have between 350 billion and 780 billion cubic meters of shale gas under its surface, making it Europe's second largest potential producer after the UK. But, unlike the UK, no well has yet produced shale gas in commercial quantities, and the prospects don't look good. In fact, after an outflow of several foreign majors, the only companies doing further drilling are state-run oil and gas company PGNiG and the country's largest refiner PKN Orlen. PKN plans to go ahead with the fracking of two wells later this year, while PGNiG's Stara Kiszewa concession in northern Pomerania, in northern Poland, sees drilling start on June 6. The results - expected after a week or so - could tell us if the country's once fabled shale future will be realized. If results are poor, then PGNiG will view the shale project as finished, the newly appointed CEO Piotr Wozniak told newspaper "Puls Biznesu." But this does not mean wild optimism has abated, particularly now that the far right is in power. Polish authorities believe they can deal away with Russian gas and source their increasing needs from overseas. Poland will not renew its long-term gas contract with Russia after it expires in 2022, a government official told an industry conference in Warsaw on May 30. Poland may buy Russian gas if the price is attractive, but purchases would “definitely not be based on a long-term contract formula”, Piotr Naimski, the government proxy responsible for strategic energy infrastructure, said at conference on investments in Eastern Europe, organised by Reuters. Poland uses about 15bn cubic meters (cm) of gas annually, and typically around two thirds of this comes from Russia. However, according to Naimski, Poland now has options to reduce gas purchases from the eastern neighbour. The country’s LNG terminal is about to receive its first cargo in June and, once in full operation, it will be able to take in 5bn cm of gas. Poland is already mulling expanding the terminal’s capacity to at least 7.5bn cm of gas, with would be nearly equal to the 8bn cm Warsaw purchased from Russia in 2015. The next article contains some remarkable figures on electric bikes, a product that only recently became affordable to the general public. However, in China alone numbers are already well into the hundreds of millions. While the press mulls electrical cars incessantly, the energy transition seems to be driving towards a different - and more efficient - means of transport. Electric Bikes Won Over China. Is the U.S. Next? An e-bike is a bicycle with an electric motor. A rider can pedal without using the motor or use it for a boost. The motors in the U.S. are generally limited to a maximum of 20 miles per hour. Recreational riders and commuters can cover long distances and handle hills without breaking a sweat. Motorcycle bans have helped lead to massive e-bike adoption in China, where more than 200 million are in use, according to Benjamin. The country is also the world’s biggest e-bike manufacturer and exporter, with giants such as Jiangsu Xinri E-Vehicle and Yadea Technology Group each able to produce several million annually. 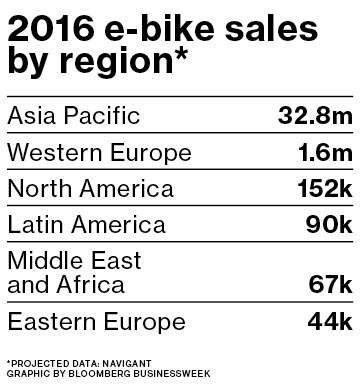 Compared with Asia, North America is barely a blip—Navigant predicts only about 152,000 e-bikes will be sold in the region this year, though it expects steady growth. “I would guess 90 to 95 percent of people in the U.S. don’t even know what an electric bicycle is,” says Navigant analyst Ryan Citron, who uses one to get to his job in Boulder, Colo. Unlike Europe, which boasts multilane bicycle highways, the U.S. is “really set up to commute by car, not by bike,” making mainstream adoption “very challenging,” he says. And to finish off this review is the renewable energy technology of the week. These tidal turbines look a pretty well finished product; time will tell how successful they can be. I will be taking a few days off next week. The press review should be back in two weeks.